SSC Recruitment 2017- Stenographer Grade C & D Vacancies: Last Date 15-07-2017. - Jobs4NE : Jobs in Assam and North East India. 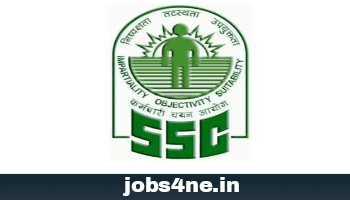 SSC Recruitment 2017- Stenographer Grade C & D Vacancies: Last Date 15-07-2017. The Staff Selection Commission will hold an open competitive Computer Based Examination for Recruitment of Stenographer Grade "C‟ (Group "B‟ Non-Gazetted) and Stenographer Grade "D‟ (Group "C‟ Non-Gazetted) in the month of September 2017. Advt No. : F.No.3/6/2017-(P&P-II). Starting Date of Online Application: 17-06-2017. Last Dateof Application Fee by Challan: 18-07-2017. Name of the Post: Stenographer Grade C & D Examination 2017. Total no. of post: Not Specified. Educational Qualification: 12th Standard passed or equivalent from a recognized Board/ University. Age Limit: Minimum 18 years & Maximum 27 years of age as on 01-08-2017. Uppet age relaxation for SC/ ST Category is 5 years, for OBC-NCL Category is 3 years & for PH Category is 10 years. Selection Process: Selection will be made on the bassis of Written Examination & Skill test. Application Fee: Rs. 100/- can be paid through SBI Challan / SBI Net banking or through credit/ debit cards of any bank. Women candidates and candidates belonging to Scheduled Caste, Scheduled Tribe, Persons with disability and Ex-servicemen eligible for reservation are exempted from payment of fee. How to apply: Applications must be submitted only in online mode. Detailed instructions as in Annexure – I and Annexure – II, may be referred to. Candidate may note that only online application will be accepted at http://ssconline.nic.in only.